In the attached photo in the foreground on the green platforms is Dizzy Rider, a Bernard Perrier design. Little Joe and Tricky Track occupies the center of the photo, and in the background is a Merry-Go-Round (carousel) built from Gilbert Erector parts. The green tower just to the left and beyond the carousel is Rider in the Sky, another Bernard Perrier design. In the upper left corner of the photo is a large Ferris Wheel built mostly from Gilbert Erector parts of late 1920s vintage. In the upper right corner of the photo, on the fireplace mantle, the red fire truck is another Erector model. The museum is in an old (1906) Craftsman style house which has been declared an historic structure by the City of Palo Alto, which also owns it and leases it to the museum for $1 a year. 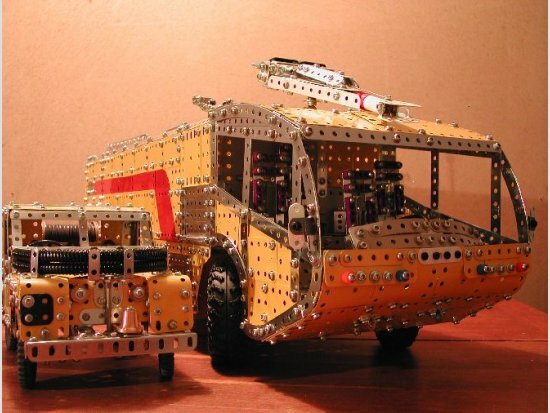 The Meccano Mania exhibit has been open since Nov. 20 and will run through March 28. 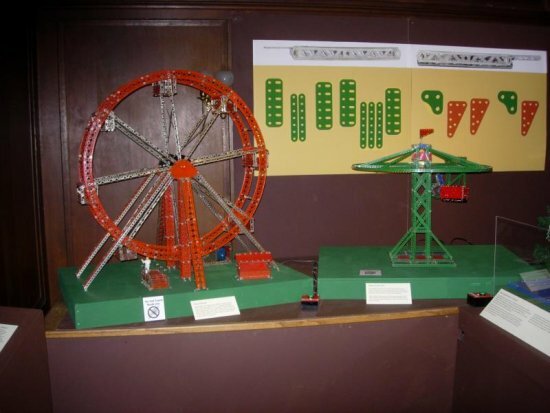 Here is a better photo of the models at the end of the main gallery: The Erector Giant Ferris Wheel (enhanced 1928-29 version) and the Meccano Rider in the Sky (a Bernard Perrier design). The Rider in the Sky and Little Joe locomotive are powered by AA-size nickel metal hydride rechargeable batteries. The batteries and chargers are carried by Radio Shack. Either model will operate all day on one charge, and the battery sets can be re-charged in about 2 hours. Dizzy Rider runs all day on two AA size cells. 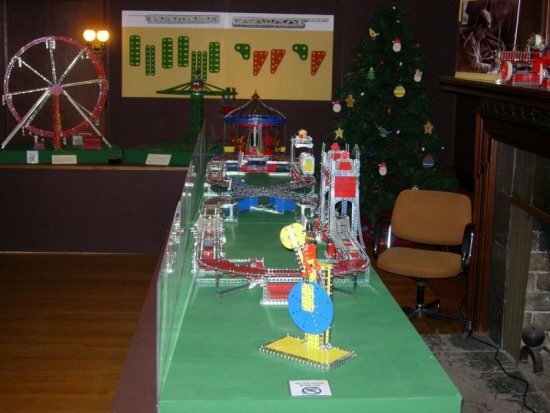 The Meccano Mania exhibit is getting 500-1,000 visitors each Saturday and Sunday and 200-400 each Friday. There are four operating models which the visitors can start by pressing a button. These models operate for two minutes and then shut off automatically unless the button is pressed again. We try to have two volunteers monitoring the models (especially Little Joe, which tries to escape from time to time! ), plus a third volunteer working the crowd. Last Sunday several visitors stayed at the museum all day, watching all the toys and talking to the volunteers. I'm told the visitor count at the LEGO exhibit next door is a bit less. Nevertheless that is worth seeing also, even if you don't like the "unmentionable plastic stuff". They have four trains running, a large rail yard and many very attractive structures that depict San Francisco landmarks. The LEGO clubs seem to be well organized and they have a lot of volunteer support. 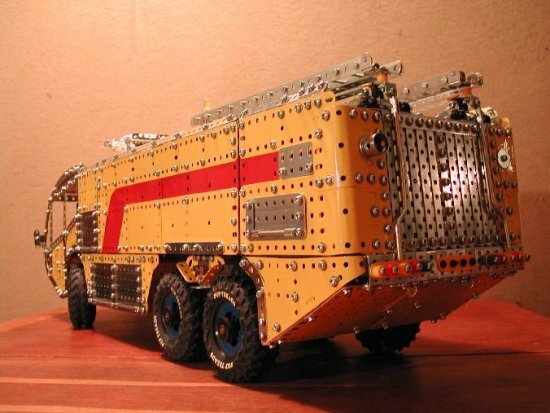 There are dozens, if not hundreds, of models put together by many builders of all ages. The museum has not lost its mandate to educate. Visitors can read about the history of Gilbert Erector, Meccano and Metalcraft in the USA. In addition there is written material on the history of the San Francisco cable cars, Ferris Wheels, riverboats and other things. 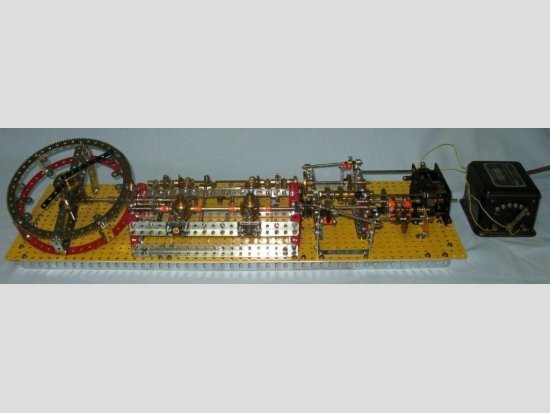 There are detailed materials that explain how cable cars run, and how a steam engine works. This photo shows the two cable cars, which are 1/20 scale models of real California Street cable cars. The model is set up as a funicular railway, which is how cable cars were actually operated in San Francisco around the turn of the 20th century. The model is visitor-operated by means of a switch mounted on a yellow plate just visible near the lower left corner of the photo. The cars stop automatically when they get near the end of travel. It was found necessary to install plexiglass panels to keep kids from derailing the cars, and one kid even attempted to pick one of the cars off the track and carry it away! There is a hole in the panel so the model can still be operated. These are real cable cars, pulled by a cable made from #20 stranded black electronic hookup wire. So far the only maintenance required has been to clean the track rails and cut a couple of inches off the cable to compensate for a bit of stretching. The model gets a real workout. Power is from a single Ignis/Exacto geared motor running on 12 volts DC at less than 0.1 amp. The two cars are of equal weight (about 7.0 lbs. or 3.2 kg. each), so all the motor has to do is overcome friction. See the attached photo which shows the underside of the lower roadway structure of my cable car railway. Purists may want to take something or hit the "delete" button! 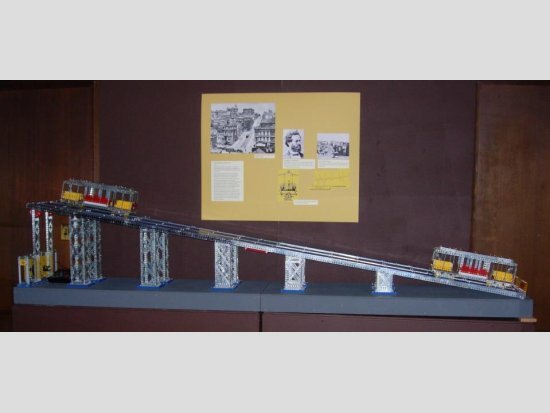 The model is made up of two inclined roadway sections, each on a wooden base measuring 20" wide and 60" long. These sections are made to exactly fit side by side for transport in my sport-utility truck. When placed end to end and connected with a link piece, I have a double-track inclined railway 10 feet in length and about 16.5" wide, which is intended to represent a section of the street. Each of the two cable cars are 30" long and are 1/20 full size. 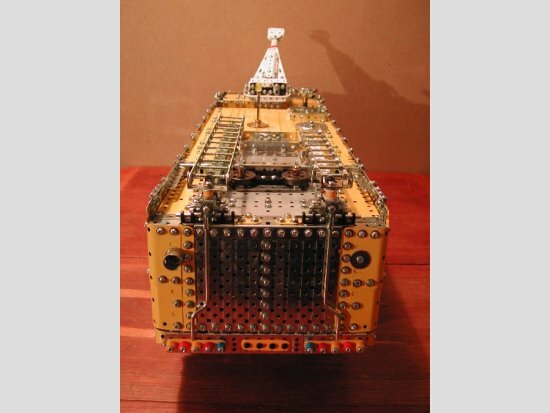 If any of you want to build this thing, Meccano part 236 (sometimes referred to as the box lid) is 13.5" long and 4.5" wide and is perfect for the center of the roadway. You'll need quite a few of these and you could probably talk Ashok Banerjee into making them for you in the right color. Or you could do it "your way" like Mike Dennis if you have the skills and the tools. Since the cable cars are 1.5 feet long you need about 10 feet of roadway to make the model look to be in good proportion and give the cable cars reasonable operating space. More will be coming about the mechanisms and what makes the cars stop automatically at the end. Does a tire exist that will fit snugly on a 162a boiler end? Tyre 142a, 2" pulley tyre, particularly the shiny black type from the 70's is a very snug fit, as you can see from the attached photograph I've used two on each boiler end on the rear axle of my latest model of a Leyland Tiger single deck bus, which I have just about completed, if it's of any help I sourced mine from Mike Rhoades. Tyres from the 'Action Man' range of vehicles are a good fit on 162a. ............... the 'Action Man' tyres we use were fitted to early a/m military toys. They are 'models' of the usual centre nave military style wheel and on the early a/m toys are in soft-ish plastic and 'complete' in profile and section. They fit on ¼" - 6mm spindles and are retained by the usual toy press-on lockwashers. They are about 4.1/4" O.D. and 1.1/8" max width. What we do is, having got them off the original rods, cut out the centre nave with a craft knife, just leaving the tyre itself. It now fits perfectly over a boiler end or, indeed, over Malcolm Booker's plastic reduction wheel hub. These tyres have very many virtues - the chief one to my mind being that, using a boiler end to simulate an 'offset nave' rim you can get the kingpin centreline within the tyre footprint with a bit of care. The boiler end also forms a useful brake drum into which you can fit realistic widths of shoes, unlike the Meccano wheel flange. you go around looking for these old toys but when you find one the first thing you do is 'pinch' the tyre to find what type it is! By this time, the seller wonders what sort of bert is messing his valuable stock about! 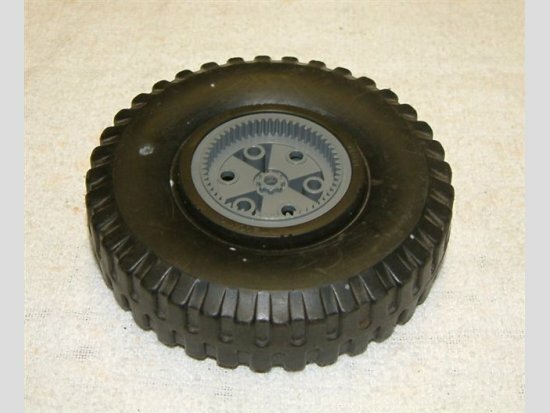 And, just in case someone asks, Palitoy, the Action Man makers, were once owned by the same group as Meccano so we regard the tyres as at least ½ kosher! I'm working on a new project but I've hit a snag - I need a large steering wheel with 3 spokes. by large I mean 3" diameter. 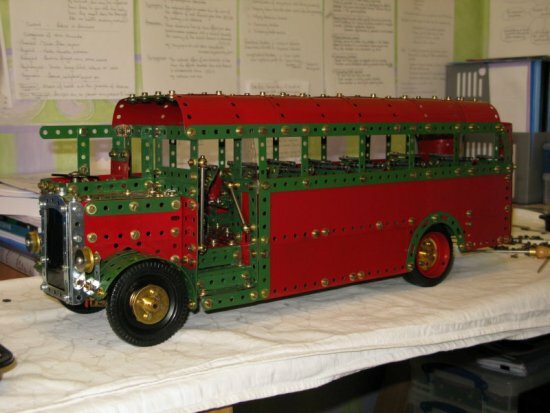 I'd rather not build it with narrow strips or similar, but would prefer to use a bent axle rod in 3 segments. So here is where I need help - I don't have access to a workshop, so could I possibly commission one of the wonderful mutilators/fabricators on the list to make it for me? As I said, the design is simple, 3" diameter circle, cut into 3 120 degree sections that I can then reassemble with couplings to link to a central column using a 3-way rod connector. I believe this was the way Eric Taylor did it for his Giant Lorry Mounted Crane. That would give you a 3" steering wheel. If you take a 12 ½" strip and bend it in a simple strip bender to a tight radius, by overlapping one hole it provides you with a circle of 4" diameter, as you can see I've done this to make a flywheel for a steam engine, I've never tried it but if bent to a tighter radius and overlapped the ends more you might get down to the diameter you want. You could then use 213b, rod connector 3 way, with short axles for the spokes and threaded bosses to fix them. The large Meccano steering wheel is about 2.5" dia. Is that not close enough? On a model, this type of difference in scale will go unnoticed. 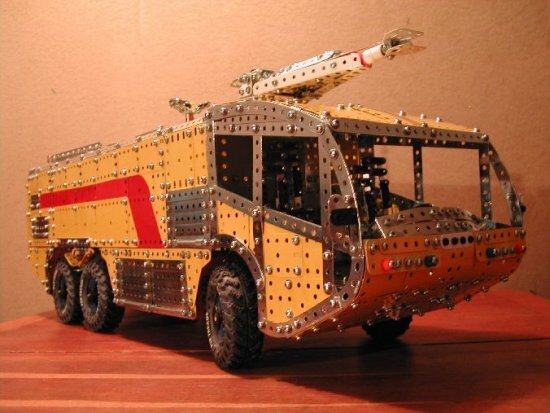 It has 3 spokes and can be obtained from any serious Meccano dealer. You could still wrap the circumference to make ist slightly higher in dia if absolutely required. 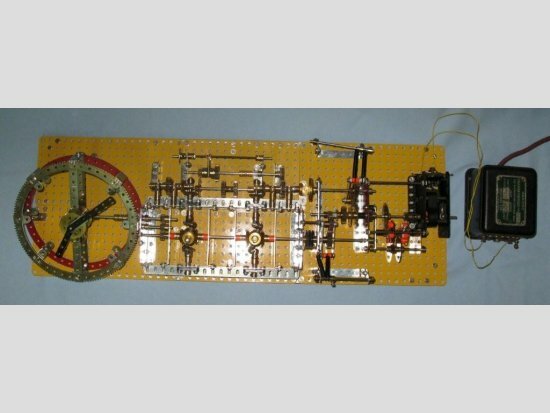 For the last few days, I have been building the model Eccentric Time, by Stephen Miles (anybody know him? ), as featured in CQ 51, March 2001. This model uses two so-called wobbly differentials, which can impart stop-start motions to any driven shaft. These two differentials are subjected to 75 different combinations of relative revolutions (by means of three different gearboxes), which will give the final output shaft many interesting permutations of what I would describe as jerky movement, sometimes including brief reverse motions as well. I have redesigned the 'clock' part. Indeed, the dials are only meant to amplify and demonstrate the final shaft motions, as they revolve much faster than actual time keeping. So the ratio between my 'clock' hands is only one to four, and can be altered at will by a simple change of gears on shafts 1" apart. And the 'clock' face is divided into only eight segments. It is indeed interesting to watch the dials jerk around with various different slow-fast-reverse movements. But frankly, the novelty soon wears off. The model hardly justifies the use of 13 no. 1" gears and twelve small bevels, plus a whole lot of brassware. I took the opportunity to use a long dormant E20R and a T20 transformer,and I enjoyed the resultant hum and smell!. 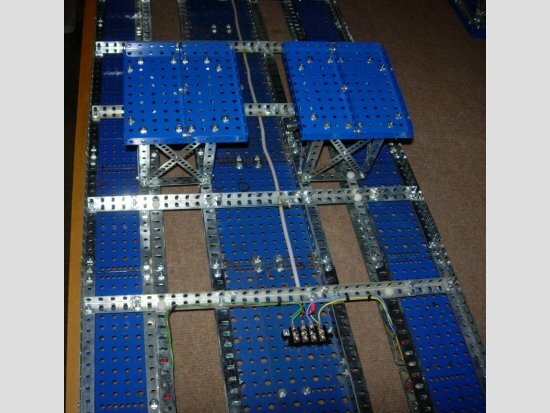 This recent weather has enabled more time that usual to be devoted to Meccano with a clear conscience. 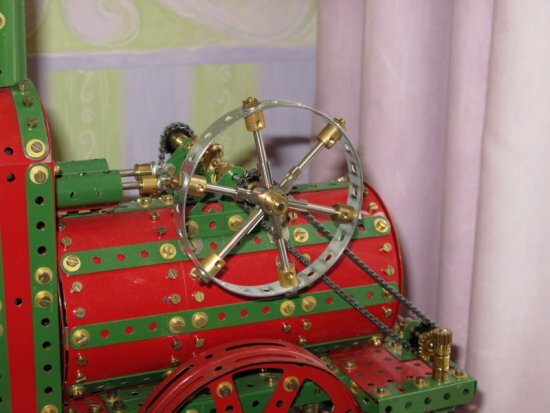 As a result slightly earlier than originally expected here are the first rough shots of Fire Engine No 22. This is a Carmichael Cobra 2 Airfield Crash Tender from 2007. Still at the constant scale of 1/12 this is likely to be the largest model (unless I start on the USA!) at 35 inches long and 9 in wide. The roof (which of course you cannot see in these two photos) is made from 2 Flanged Box Lids part No 236 bolted side by side. The red flash on the side, which is prototypical, is 1960 Light Red plates behind 1980s French Yellow. Note the Pup Tread dog chew tyres which are the correct diameter and width for this vehicle. Unfortunately I do not have a stock of Yellow 2 in Pulleys so blue has to do. No 23 is already on the stocks. Here are a couple more photos showing the Cobra with a 1950s Landrover alongside to show the size, and a top view to show those large Flanged Plates.